The door of the medicine house nearly always faces the fire. The reason for this is that it forms a connection between the fire and the medicine house. In the ceremonies of the Native Americans, directions have a distinctive representation. A medicine house built near a lake may be often run with the purpose of connecting with the lake spirit. Depending on how the it is placed within its environment it will influence the way the ceremony is connected to the spiritual world. Do you see a similarity between their philosophies concerning direction and the philosophy of feng shui here? I know I do. The medicine house is constructed with the utmost care and consideration about the environment and the kind of materials that are being used. (I think that is something that the building industry of today should also consider). Some build the medicine house in total silence.While some builders in other traditions fast for the duration of the construction. Some prefer a drum playing during the building process. Just as the modern construction worker might prefer to listen to a music station on the radio while he is working. I think of it as essentially music therapy. Frequently when a hole is made within the earth, tobacco is placed inside it. Then before the pole of willow is placed they pray over it. Smoking it in a pipe that is made of stone. Distributing it over the stones which have been heated. Making an offering on the fire. 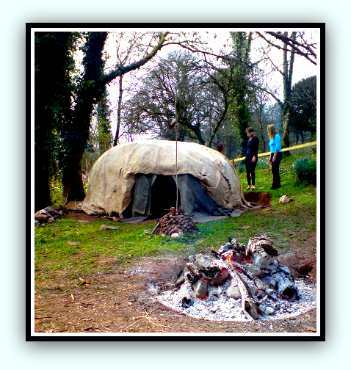 Shown below is a short three minute video showing how to build a sweat lodge. Return from orientation of sweat lodge to natural healing home Go to previous page.